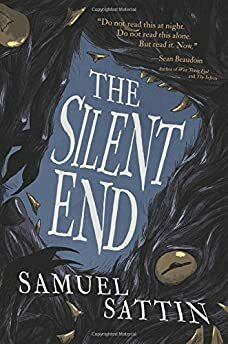 Largehearted Boy: Book Notes - Samuel Sattin "The Silent End"
Book Notes - Samuel Sattin "The Silent End"
Samuel Sattin's The Silent End is smart yet accessible, creepy and hilarious, a vividly told novel both teens and adults will enjoy. "Imagine if Halloween had been written by The Kids in The Hall instead of John Carpenter and you start to understand the wild, mesmerizing mash up that is The Silent End. Monsters and monstrous fathers, missing mothers and young love—somehow all of this and much more fits wonderfully into this book. It manages to be scary and sweet and very, very fine. Sam Sattin is a talent and this novel is a joy." The Silent End is my first conscious foray into horror. But more than that, it is just deeply weird, and even more deeply personal. As much as it is a story of teenagers facing down incalculable evil beneath their high school, echoes of real-life tragedy run throughout, notably that of my mother's death. I didn't know how much that was the case when I started (and finished) writing. Only in retrospect did I understand that I'd retold a very difficult story with tools that repurposed it for another, more immediate and carefully disguised one. The Silent End explores the ways in which we try to translate our imaginations into reality. It examines what would really happen if your dreams (and nightmares) began to manifest in daily life. In my view, human creativity is miraculous, but it's also grotesque in its inadequacy. All ideas begin as raw things, and take time to refine. But even when refined, they never quite get close enough to emulating the generative beauty of the initial concept. The characters of The Silent End are lost in a town that comes close to forgetting itself every day, and lurk in fear of creatures that crawl from the dark. Though the book's name would suggest otherwise, I found that a soundtrack naturally accompanied their disorientation. This playlist is made up partially of songs I listened to during the book's creation, and partially of songs that I likely should have. Music helped shape the town of Mossglow and its confused inhabitants, all of which are just trying to understand how and when they lost their way, and how to attain normalcy again, if such a thing is even possible. Cornelius: "The Micro Disneycal World Tour"
Tom Waits: "Little Drop of Poison"
St. Vincent: "Severed Crossed Fingers"
Carla Morrison: "Apague Mi Mente"
Peer Raben: "Verlorene Traume (Lost Dreams)," "Gefahr (Danger)"
Shigeru Umebayashi: "Efude," "On the Lake"
Nick Cave & The Bad Seeds: "Stagger Lee"
Girls: "Oh So Protective One"
Momus: "Ping Pong With Hong Kong King Kong"
The Devil Makes Three: "Ten Feet Tall"
April March: "Last Train to Christmas"
Tomoyasu Hotei: "Kill the Target"
The Fiery Furnaces: "I'm Waiting to Know You," "Nevers"
Yeah Yeah Yeahs: "Let Me Know"